DNA Genetics presents Sour Secret, a new cannabis strain created by mixing two strong parentals like the LA Confidential marihuana and Sour Diesel, resulting in a cocktail of devastating effect, that blooms in 9 weeks and yields up to 500 g/m2 of first class buds. This variety has been thoroughly tested by both breeders and customers, because for about 2 years it has been distributed as test packages in order to collect all available information from it. The final result is a genetics that pleases most users, perfectly combining the best traits of both parentals. It is a plant that shows Indica structure, resistant and with a fast growing period, doubling its height during the blooming phase. 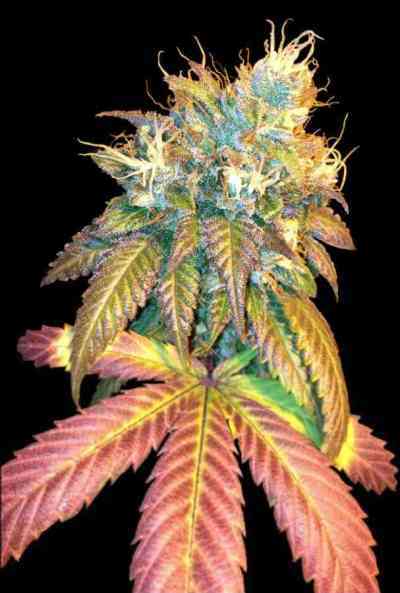 Well branched, it ripens in about nine weeks and yields about 500g/m2 of tasty buds, scattered into several tails throughout the plant. It is not a difficult strain to grow. These flowers are completely covered with highly psychoactive resin , which produces a powerful physical relaxation state, but also mentally, leaving you completelly stoned for a while. Not recommended for beginners or for those looking for a clear, cerebral effect compatible with daytime activities. Its aroma is complex and long lasting in the mouth, mixing citrus and oil aromas with sweet, chocolate, spicy hashish and undergrowth undertones.